Celenbration time for Phantoms as they are heading for the play-off finals. Photo: Tom Scott - AMOimages.com. Peterborough Phantoms coach Slava Koulikov insists the magnificent memories of last season will serve as extra motivation to claim play-off glory again. The city team booked their place in the English Premier League finals weekend after seeing off Sheffield Steeldogs at the quarter-final stage over the last couple of days. Defending play-off champions Phantoms took command of the tie with a 4-1 victory in a Saturday-night (March 26) first leg in South Yorkshire before being given a scare in a return clash at Planet Ice last night (March 27) which ended 5-5 to earn a 9-6 verdict on aggregate. Their reward is a semi-final showdown against their EPL Cup final conquerors Guildford at the Skydome in Coventry on Saturday (April 2) with the winners advancing to meet either league champions Basingstoke or Milton Keynes in the final at the same venue the following day (April 3). 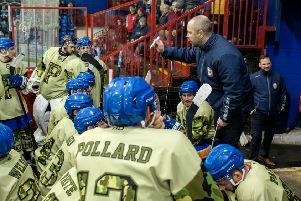 “The guys have worked so hard from the first day in our pre-season camp and it is a great feeling to be back in the play-off finals,” said proud coach Koulikov. “It was never going to be easy against Sheffield and last night was the best I have ever seen them play. “Anyone can beat anyone in play-off hockey and I guess we gave the fans a few worries along the way, but we managed to hold onto the lead we built up in the first leg in Sheffield. “A coach always wants everything to be perfect, but those scenarios rarely happen in sport. We dug in well when Sheffield came back strongly and we kept our discipline when we had to go without the puck for long spells. “That was almost back to how we did things last season when we were happy to soak up pressure and break quickly, but this team likes to play with the puck and we have showed how successful we can be doing that. “I have always said that stats mean nothing when it comes to play-off time and the games against Sheffield proved that. “We had beaten them in all six games during the regular season, but five out of the six periods over the weekend were really even. It was only really the first one in Sheffield that we managed to control and that set us up to reach Coventry. “We all know how good it felt to win the play-offs last season and that just makes us all the more determined to do it again. Phantoms certainly have a score to settle with the Flames after crashed 12-6 on aggregate them in the EPL Cup final earlier this month. The damage was done in a disastrous 9-1 drubbing in Surrey in the opening leg, but Phantoms have otherwise performed well against Paul Dixon’s side. They edged the head-to-head record in the regular season and also won the second leg of that knockout showpiece. Tthe two sides finished only five points apart after the 54-game regular season with Phantoms in runners-up spot and the Flames in third. Koulikov added: “We are two teams with good goaltenders and good offense. We have matched up well in the league and it is probably a 50/50 game in the semi-final. “We have to learn from what happened in the cup final and make sure there is no repeat of that. “It is a very different scenario for us compared to last year when we had to face Telford, who were the top team, in the semi-finals. “A lot of people would have expected us to be out after one period, but we came through it and went on to win the final too. Koulikov is unsure at this stage whether or not import ace Darius Pliskauskas will be available for the finals. The Lithuanian international missed the quarter-final tie against Sheffield for family reasons. “It is difficult to say if or when Darius will be back,” continued Koulikov. “But we wish him all the best as he has to deal with a tough situation.